Is this amazing, or what? 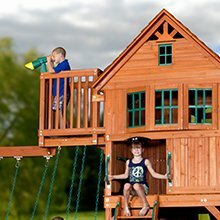 I was looking for the best climbing toy to review for the Active Play section and came across this remarkable gym set: the Backyard Discovery Skyfort II All Cedar Wood Swing Playset. I know, it’s a mouthful, but what I wouldn’t have given to have one of these when I was a little girl. 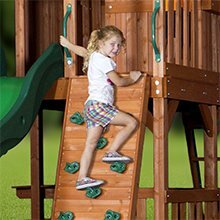 Like most kids, I loved to climb. I remember conquering the tallest tree in our back yard and settling onto a branch to read the next Anne of Green Gables novel. I remember how we would swing hand-to-hand on the aptly named monkey bars and pretend to be chimpanzees, and how we’d climb onto the porch rails with towels knotted at our necks, then leap off, certain that, sooner or later, our capes would make us fly. 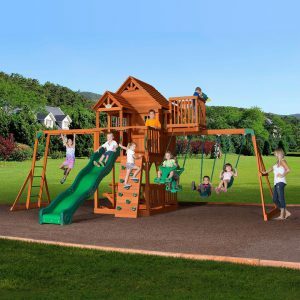 This playset has everything children need to build memories like those. It’s recommended for children from 3-10 years. And it of has a ton of great features. Here are some of them. A clubhouse, like a treehouse, at the top. It has windows, a wood roof, and a covered entry way. The front porch has a balcony, and there’s even a crow’s nest. The perfect place to play pirate or Swiss Family Robinson, or just curl up and read a book. A picnic table for four, under the clubhouse, because everything tastes better when you’re having a picnic. 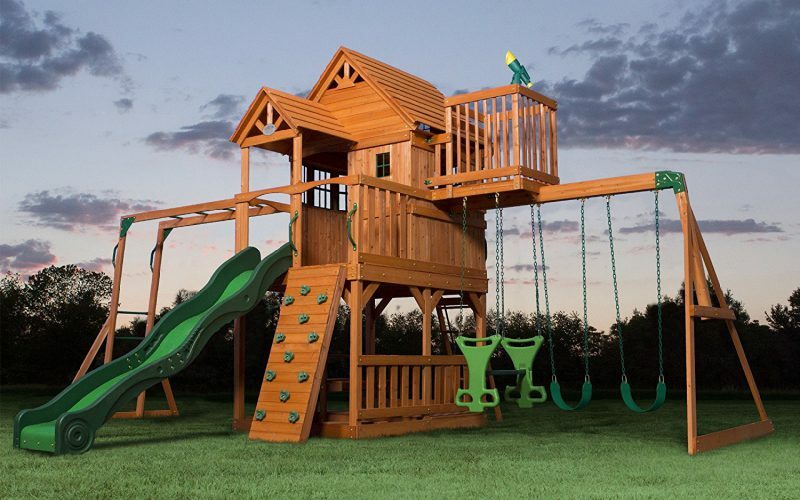 Two belt swings and a two-person swing set glider. 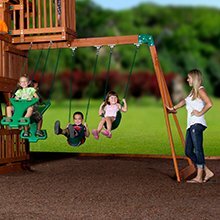 The glider is great for children who are too young to be able to pump a standard swing. They can get on the glider and push them selves, so you don’t have to. Those are the pros. There are also some cons. As far as I can tell, they’re all related to maintenance and assembly. The stain is strictly for looks, so you’ll have to apply a sealant at least once a year, to protect the wood from weather and other environmental damage. This thing is heavy and huge. The specs say it’s 720 pounds by itself and almost 800 for shipping. It’s a beast to put together. Seriously. Lots and lots of parts. If you’re handy, you and a helper can probably do it in a few days. If you have a bunch of handy friends to help you, and you’ve organized everything thoroughly ahead of time, you can do it in a day. If you’re not handy at all and you’re trying to fit it in around the rest of your schedule, it could take weeks. Some people mentioned splitting wood, but that doesn’t seem to be an issue if you pre-drill the holes and seal everything properly. The instructions that come with it aren’t always easy to follow. There’s a pdf of the instructions here. But if you can afford it, it might be worth it to hire someone to put it together for you. I myself am not handy, so the best advice I can give you is to go to Amazon and read the reviews. The ones with four and five stars go into a lot of detail about how to put it together. My verdict: If you’re prepared for the labor-intensive assembly, the end result should be worth it. I’d love to hear from you in the comments. What are some of your best climbing memories? Oh wow! What I would have given to have had one of these babies growing up. I, like you was also a climber. Sitting in a tree, reading a book brings back great memories by the way. My daughter is almost 5, and I think this would be perfect for her. I can already imagine the many hours of fun we will have together. Plus, I love to build things, and this looks like a fun challenge. I am glad I came across. Thanks for the great information. I’m glad you enjoyed reading about it, Patrick. I just fell in love with it. I don’t have any little ones, but I did have, I would want to have one of these in the back yard. If you do decide to get it, please let us know how you and your daughter like it. You sound like a great dad! Have a question, request, or concern you'd like me to address? Email me at: Beth@childrensbooksandlearning.com. I'd love to hear from you.